Summary and Definition: The Powhatan tribe were Algonquian people who inhabited the lands of Virginia. The tribe fiercely resisted the English colonists invasion of their homelands which led to a series of wars and conflicts. The names of the most famous people of the tribe were Chief Powhatan, his daughter, Pocahontas and his brother Opechancanough. What was the lifestyle and culture of the Powhatan tribe? The Powhatan tribe were leaders of the powerful league of tribes called the Powhatan Confederacy. They inhabited Virginia, from the Potomac River in the north to south of the James River, and parts of the Eastern Shoreline. Their leaders had absolute authority, unlike the more democratic tribes of the Northeast woodland cultural group. These powerful people lived in highly organized, fortified villages of longhouses, called 'yehakins', which were surrounded by their farming lands containing their crops of corn, beans and squash that covered up to 200 acres. They were also hunters and fishermen in and around Chesapeake Bay using large dugout canoes as much as 40 - 50 feet long. The English colonists in Virginia came into conflict with the tribe which led to a series of Powhatan Wars. The most famous members of the tribe were Wahunsonacock, who became known as Chief Powhatan, and his daughter, Pocahontas. The Powhatan Confederacy was a league of over 30 Algonquian speaking Native American tribes that were located in Chesapeake Bay, Virginia and Southern Maryland. The names of the tribes associated with the Confederacy included the Potomac, Chesapeake, Mattapony, Secacawoni, Chickahominy, Nandsemond, Weanoc, Pamunkey, and the Mattapony. The tribes of the Confederacy fought in a series of conflicts known as the Powhatan Wars from 1609 - 1646. The power of the Confederacy came to an end as did the Powhatan Wars in 1646. Where did the Powhatan tribe live? The Powhatan are people of the Northeast Woodland Native American cultural group. The geography of the region in which they lived dictated the lifestyle and culture of the Powhatan tribe. What did the Powhatan tribe live in? The Powhatan tribe lived in towns of Longhouses made with birch bark. The longhouses varied in size, the largest longhouses were 200 feet long, 20 feet wide and 20 feet high, had two levels and housed as many as twenty families. The windowless Longhouses had a rounded roof, doors at both ends and a smoke hole in the roof that let in air and light. Their villages were generally located alongside a river and consisted of from three to one hundred different structures. The elongated longhouses were made of saplings that were bent and tied and covered with bark and woven mats. What language did the Powhatan tribe speak? The Powhatan tribe spoke in a form of Eastern Algonquian, a family of languages used by various tribes along the Atlantic Coast. What did the Powhatan tribe eat? The food that the Powhatan tribe ate included the staple crops of corn, beans and squash that were raised by the women. Tobacco was also farmed by the men. The produce from the crops were dried and preserved for later use throughout the year. The food also included nuts, grains, vegetables, mushrooms, tubers, roots and fruits (blueberries, strawberries, plums and raspberries). The men also provided meat from deer (venison) and smaller game like squirrel, opossum, rabbit, wild turkey and duck. Fish such as sturgeon, pike and a variety of shellfish such as clams, oysters, lobsters and scallops were an important part of their food supply. What weapons did the Powhatan use? The weapons used by Powhatan warriors included bows and arrows, spears, war clubs, tomahawks and knives. What clothes did the Powhatan wear? The men of the Powhatan tribe wore simple clothes made from deerskin (buckskin) which consisted of a breechcloth that was passed between the legs and attached to a cordage belt. Leggings and moccasins were worn on hunting trips in the forests. The women wore a deerskin apron and like the men they also wore moccasins and leggings when working on the land or gathering food in the forest. Fur cloaks were worn in the winter. Their clothes were often decorated with painted designs, fringes and beads. Both men and women of the tribe tattooed their bodies and painted their faces with a mixture of red paint and nut oil. 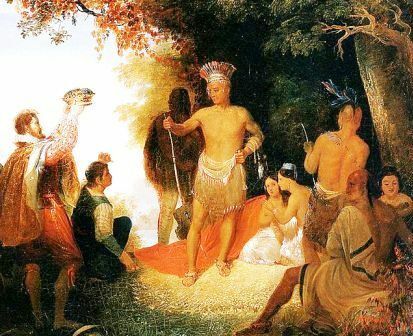 Powhatan History: What happened to the Powhatan tribe? The following Powhatan history timeline details facts, dates and famous landmarks of the people. The history timeline explains what happened to the people of their tribe. 1617: Pocahontas dies in England and was buried on March 21, 1617, St George's Church, Gravesend, Kent.